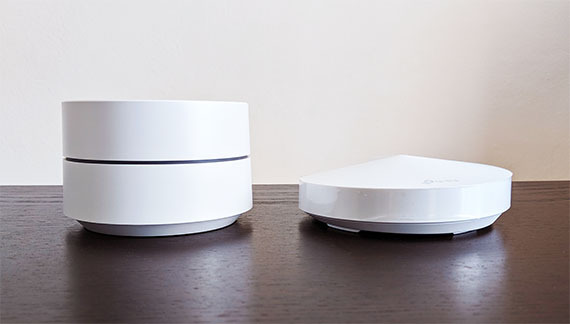 The TP-Link Deco M5 and Google WiFi are two popular dual-band WiFi systems (the Google WiFi had the advantage of being released several months earlier than the Deco M5), both sharing very similar traits, while also focusing towards the same type of audience: users that have a large house with lots of wireless “dead-zones”. The concept of a wireless mesh system is not something that got invented in the last four years, it is actually quite old (more than a decade) and was commonly found inside an enterprise or military environment. Similarly to every other technology, as it ages, it gets less expensive to implement and, as expected, even the mesh tech has been ported to the consumer market in a proprietary form in order to interconnect two to three (usually) identical nodes. 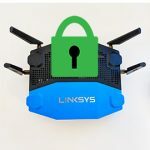 During the past three years, every major networking manufacturer has released its own version of a WiFi system, each aiming to bring something unique to the table: Linksys, Netgear, Zyxel and the second gen Eero created tri-band WiFi systems (Orbi and Multy X have dedicated a band to backhaul, while both the Velop and Eero left the three radio bands available for the wireless clients) and the older first-gen dual-band Eero, Luma and Ubiquiti AmpliFi HD had a lot more time to perfect themselves, therefore making the mesh technology more simple to implement and more affordable. The Deco M5 and the Google WiFi promise a high level of simplicity and an above average wireless performance (all that at an affordable price tag), so let’s see which is the better one. Note: You can also check the full review of the TP-Link Deco M5 and the full review of the Google WiFi. 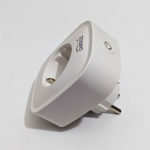 UPDATE 01.04.2019: Close to two years have passed since I last tested the Google WiFi and the TP-Link Deco M5 and, considering that during this time period, both manufacturers have released multiple firmware updates, I decided to retest the systems and see what kind of improvements have been made. The Google WiFi uses the firmware version 11021.84.4 and the Deco M5 uses the firmware version V1_181227. The article was UPDATED on 10.29.2017 to reflect some changes that have been made with the latest firmware updates. 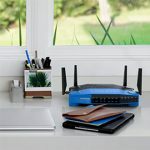 Unlike the regular wireless router (where few stray from the traditional design blueprint), the WiFi systems manufacturers have gone to some lengths to ensure that their devices are uniquely designed and won’t be mistaken for other systems from the competition. 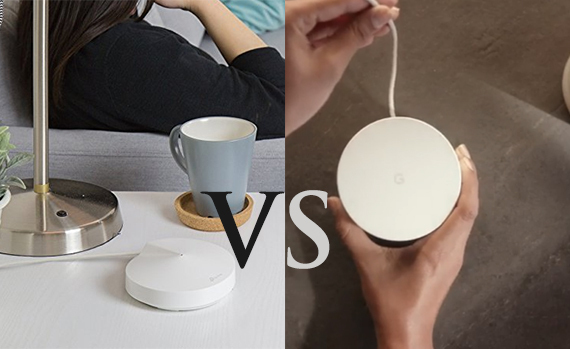 So, these systems can be found in various shapes and sizes, but, the one that I think has the best design so far, is Google WiFi (yes, this statement still hold true even in 2019). 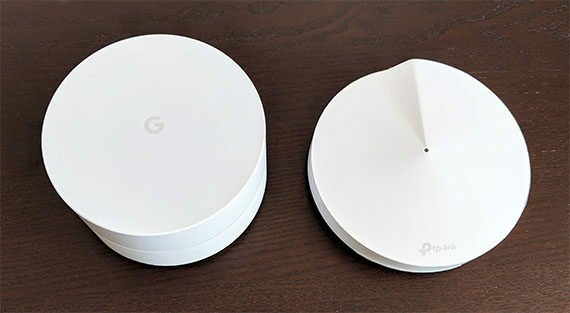 Google’s WiFi system offers three identical units (you can also purchase a single unit), each node (also called point) being quite small (it measures 4.17 x 2.70 inches), but heavy enough to ensure it won’t budge after you connect the Ethernet wires (it weighs 12 ounces). The small cylindrical case is horizontally divided into two parts and in the middle, there’s a narrow section which houses the LED light (the exterior is covered by a matte finish, so it won’t retain any fingerprints). It’s clear that TP-Link had the Google WiFi appearance in mind (and, maybe, the Eero system) when it designed the Deco M5 since every node is also quite discreet, small and cylindrical. 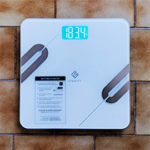 But that’s where the similarities end, since a single unit measures only 4.7 x 1.3 inches and it weighs 8 ounces, there’s a lower chance that it could fall off the table. Furthermore, while a Google WiFi node is elegant, but a bit conservative looking (it could easily pass as a cream recipient), TP-Link gave the Deco M5 an unusual top side: the case swirls on the upper side to give a seashell-fractal overall impression. Similarly to the other WiFi systems, the Deco M5 is covered by a white matte finish (so, not a fingerprint magnet) and, along with the Google WiFi, it can be easily positioned anywhere in the house. 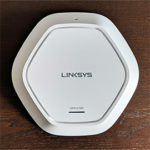 Furthermore, because of the minimal design and the small form-factor, neither will attract too much attention (that’s an advantage that the the Linksys Velop and the Netgear Orbi lack, since both are taller devices which, inevitably will need more careful planning before being positioned inside the room). 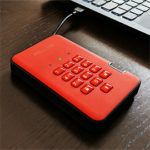 But, the small size may come as a disadvantage when talking about heat dissipation. 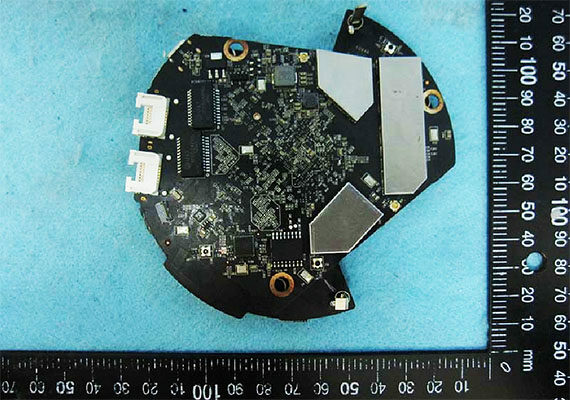 TP-Link did not break the design continuity with any vent holes, but it did add a substantial amount of cut-outs on the bottom which have proven to be useful to a certain degree, but the units still got warm to hot during testing. The Google WiFi, on the other hand, lacks any relevant cut-outs which would suggest that it may have a harder time keeping the temperature in check – despite that, no unit overheated and barely hot warm towards the top (this is something that may change as the devices age a bit more). 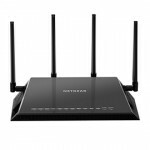 The advantage that both the Google WiFi and the TP-Link Deco M5 have over the other WiFi systems is that any unit can act as the main router, while any other unit can be the satellite (while the Netgear Orbi, the the Ubiquiti AmpliFi HD and Eero Home WiFi second gen have a router unit and extenders, which are not interchangeable). Like I mentioned earlier, the Google WiFi has a narrow section which is home to a LED that has the role of showing the status of the network and the node by displaying different colours: flashing amber signifies that the node has no Internet connection, flashing red indicates an error, while solid blue means that the device is returning to factory default settings and solid green-blue indicates that everything is working properly and the node is registered. The Deco M5 also has a LED which shows the status of the network, but it is a lot less intrusive (almost unnoticeable) and lies on the top of every unit (similarly to Linksys Velop). The LED will flash blue when the node is ready for setup (solid blue means that it is setting up), solid red indicates an error and solid green means that everything is working properly. During the night, the LED can be turned off. I do see the value in the simplicity of these devices, but I’m not sure using a single LED setup is the best way of showing the status of the system, simply because colours are not an universal construct and, while red may indicate an error in pretty much all systems, blue, green or yellow could mean anything (sometimes they’re implemented into two phases: solid and flashing). So, people need to have the manual at their side to understand what’s going on with their network and that’s the opposite of simplicity in my book. Fortunately, manufacturers have started to support various ways to configure the WiFi systems via voice control (such as compatibility with Amazon Alexa), but, so far, this system is still quite crude and will need a longer period of time to be fully implemented (so far, both the Google WiFi and Deco M5 support basic voice commands through Alexa). 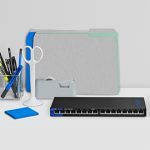 Every TP-Link Deco M5 node has the same ports and buttons on the bottom and rear side: a Reset button, a USB Type-C port (which is used solely for powering up the router – it’s not compatible with any external storage device) and two Gigabit Ethernet ports (WAN/LAN – depending on the node, if it will act as the main unit or if it will be a satellite). As a side note, TP-Link released a second version of the Deco M5 which lacks the USB Type-C and, instead it has a regular circular Power port. The bottom of every Google WiFi unit has a large carved zone that gives you access to a USB type-C port (for powering the router) and two Gigabit Ethernet ports (one port will act as WAN if the node is the one that will connect to the Internet, while the other nodes will have two available LAN ports). 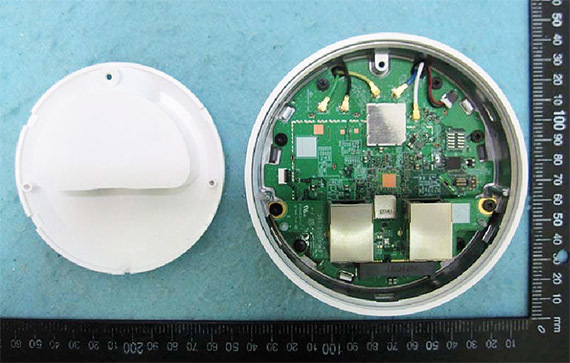 The Reset button is located on the back side of the Google WiFi, where the LED section is interrupted. 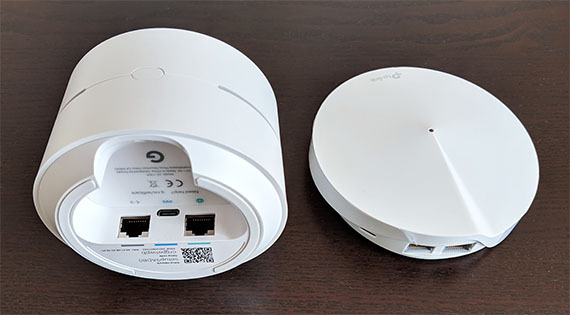 Verdict: The Google WiFi and the TP-Link Deco M5 are very similar WiFi mesh systems from the design point of view: both have three identical units, both have a single LED indicators and two Gigabit Ethernet ports, so, in the end, it will come down to user preference. Even if I do prefer the design of the Google WiFi, since beauty is in the eye of the beholder, I will call this round a tie. Every TP-Link Deco M5 is equipped with a quad-core Qualcomm Atheros IPQ4019 chip (at 638 MHz), a Qualcomm Atheros QCA8072 switch chipset, Bluetooth 4.2 BlueCore WLCSP chip, 256 MB of RAM and 32MB NOR flash memory. The 2.4GHz radio band makes use of the Qualcomm Atheros IPQ4019 chipset and the 5Ghz radio band also uses the Qualcomm Atheros IPQ4019 chip, along with a Qorvo RFMD RFPA5542 Power Amplifier. 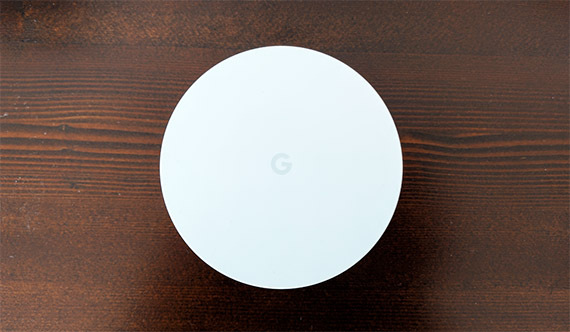 Google WiFi is built on the same platform, so it’s also equipped with a quad-core Qualcomm Atheros IPQ4019 chipset (at 717 MHz), a Qualcomm Atheros QCA8075 Gigabit Switch, 4GB eMMC flash memory / 4MB Winbond 25Q64FV and 512MB of RAM. The 2.4GHz radio band uses the Qualcomm Atheros IPQ4019 chip and the 5GHz also uses the Qualcomm Atheros IPQ4019 chip with the Skyworks SKY85717-11 integrated module. Similarly to the Deco M5, the Google WiFi also takes advantage of the Bluetooth 4.2 technology and the ZigBee technology (although not officially, a version without ZigBee support has been spotted at the FCC). 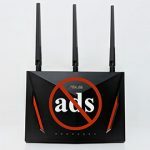 TP-Link Deco M5 is advertised as featuring a maximum theoretical data transfer rate of 400 Mbps using the 2.4GH band and a maximum theoretical data transfer rate of 867 Mbps using the 5GHz radio band. 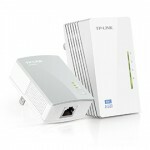 Added together (and rounded), we get 1300 Mbps per device. A Google WiFi unit is advertised as being an AC1200 class router, so, using the 2.4GHz radio, the maximum theoretical data transfer rate is 300 Mbps and, while using the 5GHz radio, the data rate is 867 Mbps (adds to 1167 Mbps and rounds to 1200 Mbps). Verdict: Both the TP-Link Deco M5 and Google WiFi are built on the same platform (Qualcomm Atheros IPQ4019) and each is honestly advertised as being AC1200 and, respectively AC1300 class devices (no inflated numbers on the box this time), but the Google WiFi has a slight hardware advantage, so it wins this round by a nose. Although WiFi systems such as Eero first generation, Luma or Open-Mesh were already taking advantage of the wireless mesh technology in a home environment, Google WiFi was the one that really took it into the mainstream and made this type of approach a lot more popular. No, it did not bring anything new to the table over older systems, but it did make the mesh approach simple, affordable (maybe the most important factor) and it definitely used its brand name to reach a higher level of trust. So, it’s clear that Google did a lot of things right and the later released TP-Link took some notes and also released an affordable system that operates pretty much in the same way, but it has added some twists to separate itself from the bunch (which I will address a bit later). 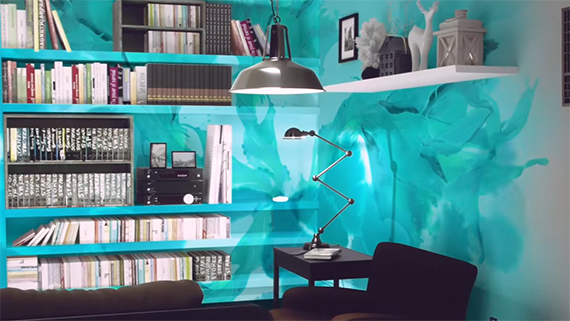 The implementation of the wireless mesh technology inside a home has the potential to cover larger areas and leave no corner untouched which is something that even a high end router can miss if the walls are thick and the house is very large and old. 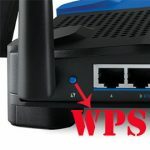 In order to take advantage of the wireless mesh, you need to connect one node (can be any unit) to the Internet and spread the other units around your house (most systems will let you know if the distance between nodes is too high). So, depending on the position of your wireless clients, the data will only go through one node or, if necessary, it will travel through the second or even the third node to reach its destination.